At the Burns Night on Saturday 19th January held in Bournemouth, which consisted of over 200 diners, our Provincial Grand Master, David Ashbolt, made an important announcement. 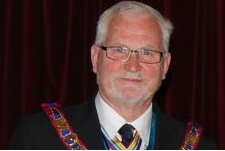 After 21 years of service in London Mark – from ProvADC through ProvSec and DepPGM – and having spent the past 7 years as our PGM, he has sadly decided to stand down as from July 2019. He has thoroughly enjoyed every minute of each role that he has undertaken and has been the driving force behind our Province. We are sure that he will still be supporting his successor and all of us for many years to come. Thank you, David, for all you have done for The Mark! And more information on the Burns Weekend and accompanying photographs will be on the website by Wednesday.